For many travellers taking the Trans-Mongolian rail route to China Irkutsk is usually the last Russian town they stop at before heading to Mongolia. 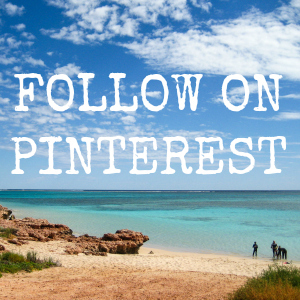 It is the perfect place to pause for a few days and check out the natural wonder that is Lake Baikal. 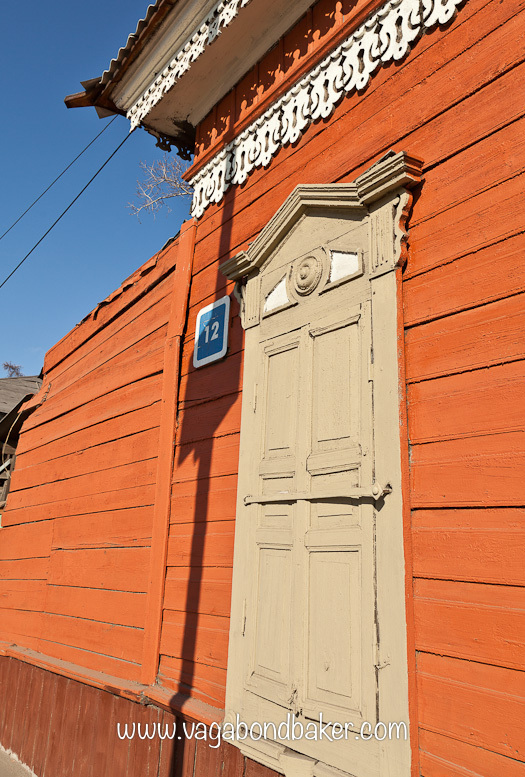 This compact Siberian city has a fine mixture of colourful, old wooden houses and severe Soviet architecture. 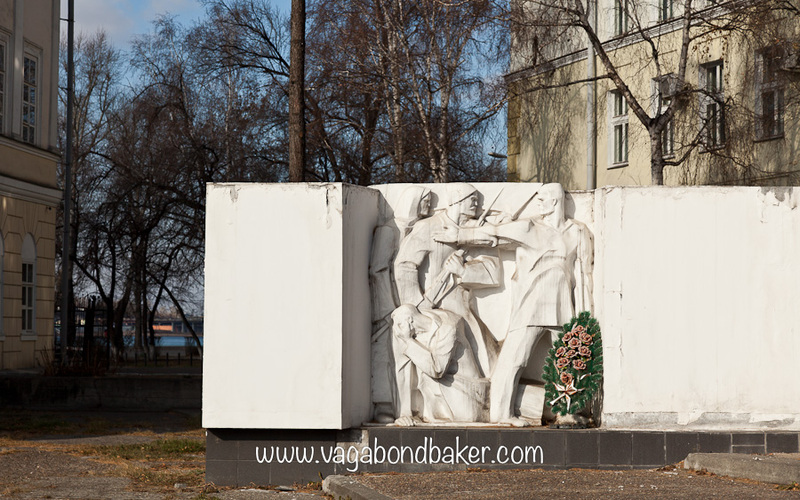 We spent a day exploring before we set off to Lake Baikal, there was a bit of a tourist trail around the city taking in statues, monuments, parks and buildings. Under clear blue skies we stretched our legs after the long train journey and saw some of the sights along with our new train friend Tori. 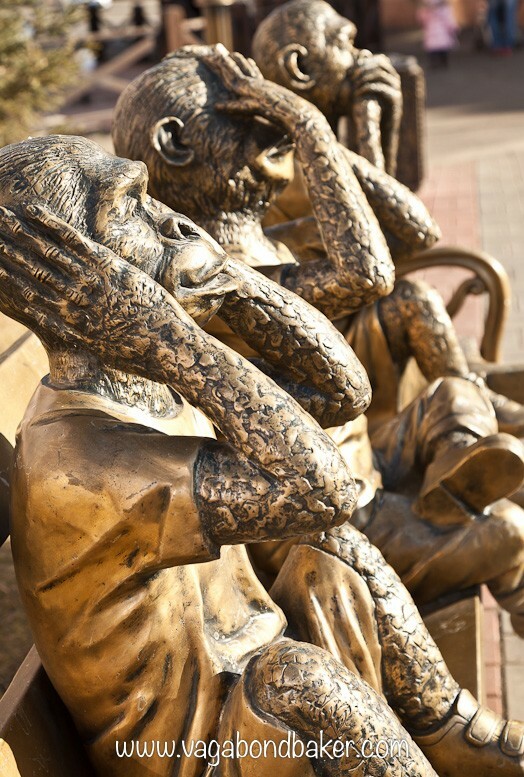 There was a sweet little sculpture park near our hostel which had a collection of fun statues, my particular favourite was the Hear no evil, see no evil, speak no evil monkeys. 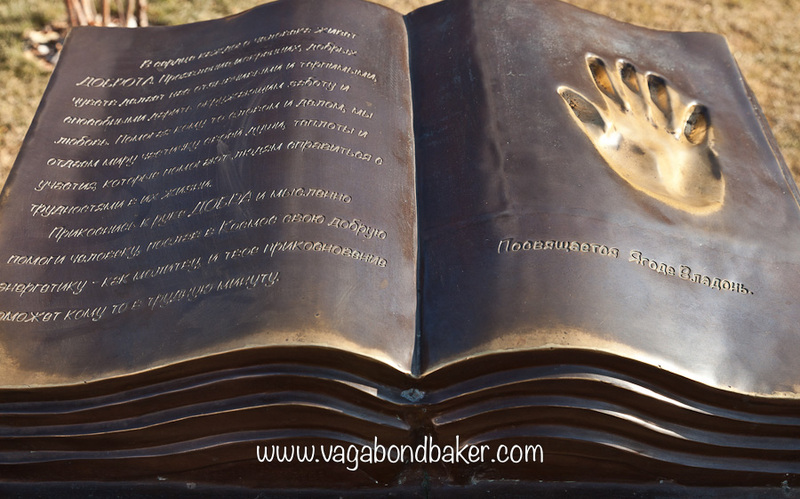 We found that many metal statues around Russia had parts that were polished bright from people rubbing them for luck, this sculpture of a book was just asking for some tactile touching. 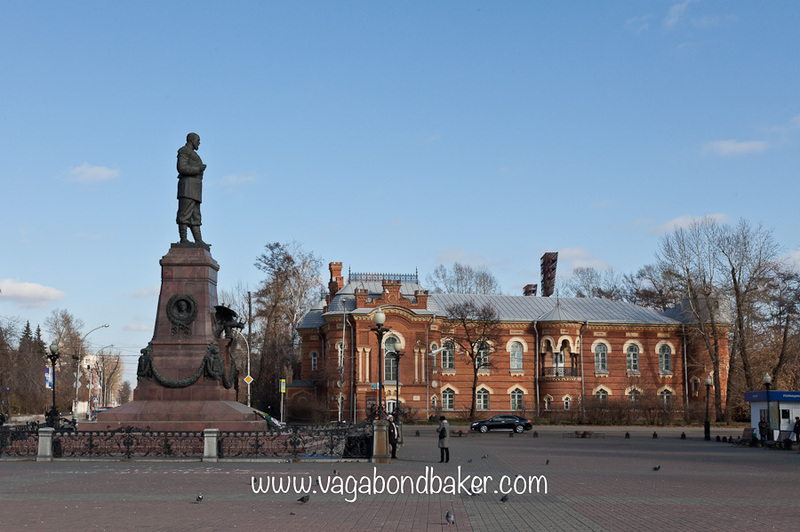 Down by the river the city opens out into a bright square, watched over by a monument of Tsar Alexander III. From here you can look across the wide river to the railway station. 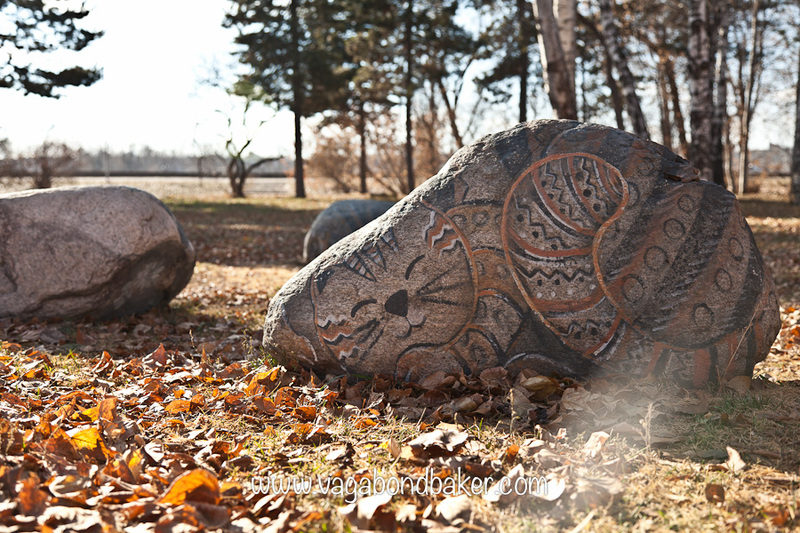 There is some parkland beyond the square where we found this sleeping feline rock among the fallen autumn leaves. 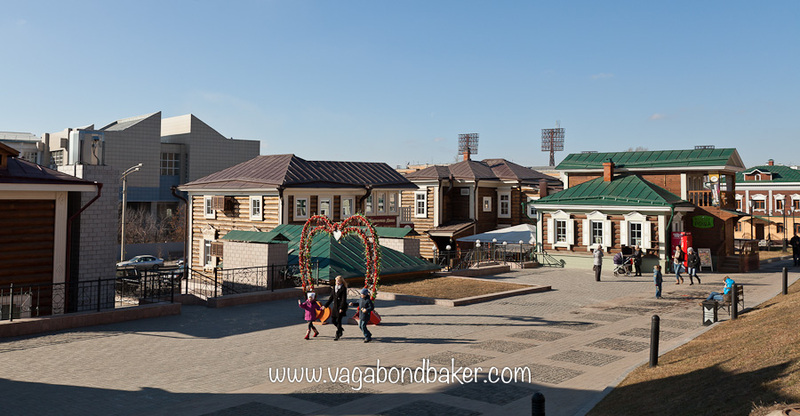 In the centre of Irkutsk is the old town, a curious blend of overly restored old wooden buildings and carbon copy modern ones, remodelled as bars, shops and restaurants, all with a resort feel. 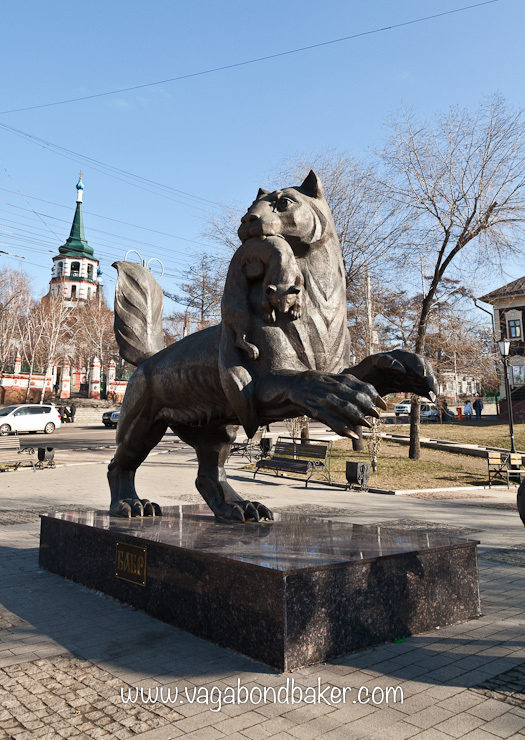 At the entrance stands the city emblem, a Siberian tiger with a sable in its jaws, seen on the Irkutsk coat of arms. A shiny new mall can be found at the far end, with a cinema and food court. We walked to the north of the city to find the Saviours Church and the Bogoyavlensky Cathedral. The former a white, neat looking church with very old, worn but still readable murals painted onto the facade. 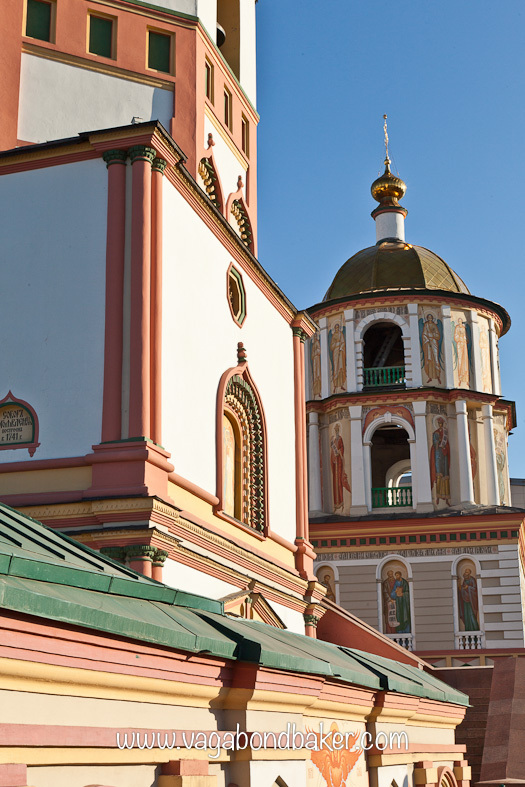 Across the road from it is the far more fantastic looking Bogoyavlensky Cathedral with its multicoloured onion domes, pink walls and painted frescoes. The whole area smelled deliciously like doughnuts but we never discovered where the scent came from, despite trying to follow our noses! 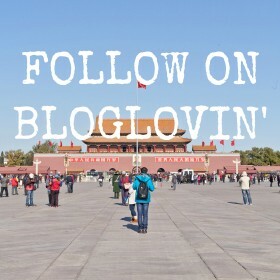 From our cultural wanderings we found the Chinese Market, a cornucopia of cheap food shopping, from baked goods and fancy cakes to train-friendly noodles and dried foods. The fruit and veg were piled high, the tiny grocery stalls hid their vendor under reams of soup packets and coffee sachets. Govindas, a canteen style vegetarian restaurant filled our bellies for the night, we had an early start the following day, a minibus ride up to Olkhon Island on Lake Baikal…..
Heavenly Olkhon Island, Lake Baikal Just the most beautiful place, get off the train for a few days and head up to this island on Lake Baikal. 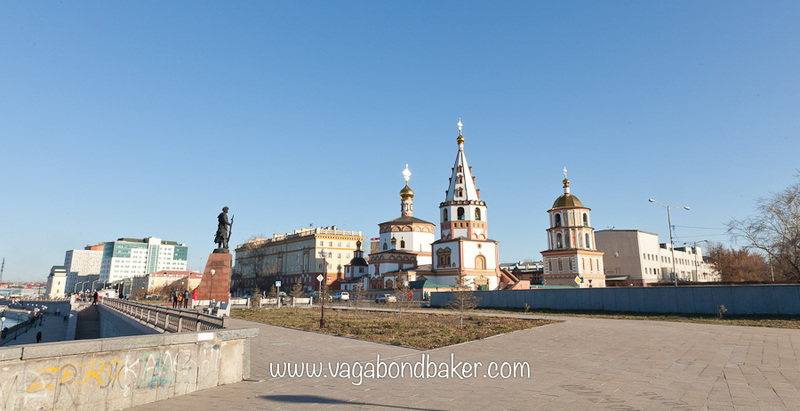 Breaking Up The Vastness Of The Journey In Yekaterinburg, Russia A perfect pause on the Trans–Siberian. Moscow. Lenin, Gorky Park and a Soviet Space Shuttle! Exploring Moscow and finding some surprises. From Russia With Love, Red Square Moscow. It’s iconic, and it’s fantastic! Haha, that would be a perfect snap! So you must definitely do the trans-sib now! I have intense memories of Irkutsk… going out for a walk and getting caught in a terrible sand storm (during which my friend received a nasty gash to the head… and a couple of locals supposedly lost their lives). The power was out over the whole town and trees were all over the road. Oh goodness, that sounds terrible! We were very lucky with the weather, have been all trip so far, blue skies and sunshine. I can’t even begin to imagine such dramatic weather in Irkutsk. Thank you, I’ll keep the posts coming! I can hardly believe you were in Irkutsk! I only remember it from playing the board game “Risk” when I was young. 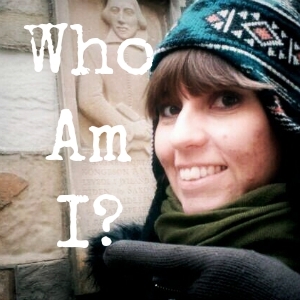 Don’t know if I’ll ever get there in person. I love all the statues, especially the Siberian Tiger. And so strange seeing modern buildings in the photos, I don’t really expect that in Irkutsk. Also surprised you found a veggie restaurant! Hahaha, was Irkutsk on Risk? that is very cool! 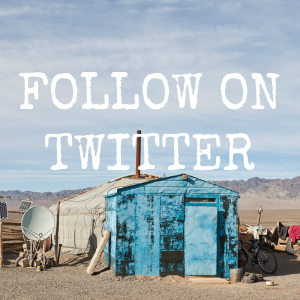 You should try one day to get there, do the Trans-Siberian- you would love it! 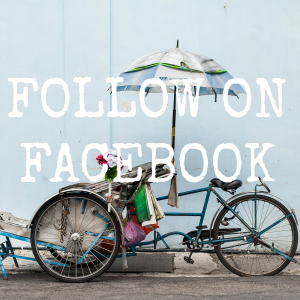 It’s one of the best ways to interact with real people. Every old place we go these days has super modern buildings, love the jarring effect of the old and the new together.